If you have chipped a front tooth, often playing sports, you know how embarrassing it can be to smile. However, you may be worried that the tooth will need a porcelain veneer or dental crown to fix it, and you might be worried about the cost. The good news is, for patients of our Charlotte dentist office, there is a very affordable, conservative (meaning we don’t drill the tooth away), and completely natural-looking way to fix broken front teeth with composite bonding. This young lady came to us as a new patient recently, wanting to know what could be done about fixing her chipped front tooth, which she’d broken playing sports some time ago. A very attractive young lady, she was embarrassed to smile big because the chipped tooth was right in the very front. Because the broken part of the tooth wasn’t small, it wouldn’t be unreasonable for a dentist to suggest a very thin porcelain veneer to repair this tooth. Her teeth have a lot of character to them – a noticeable shift from darker at the gums to lighter at the edge, some whitish spots and lines, etc. – which make it very difficult to match believably with bonding. 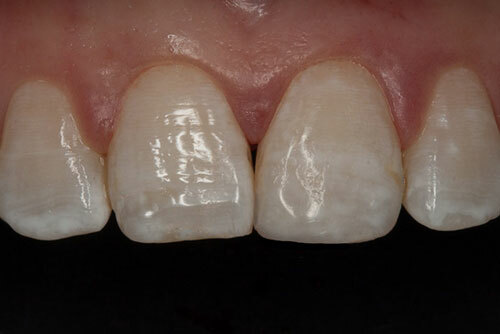 However, even a very conservative veneer would require removing more healthy enamel than necessary, and conservative tooth-colored bonding, or composite resin, is also strong and long-lasting, you just need a dentist skilled at matching all those details. Can You See The Filling? Matching a single front tooth is usually considered the greatest challenge in cosmetic dentistry, so many dentists will recommend fixing the 2 front teeth at the same time, because it’s easier to make a pair of teeth match with a good dental lab. However, that’s a lot more expensive, and again, requires removing even more healthy enamel unnecessarily. This was a very difficult case, which did take about 75 minutes to get just right, but as I’m sure you would agree, the patient was thrilled with the result, and to tell the truth, so was I. Given how natural the result is even this close, in her smile, it’s really impossible to tell anything was done.